Ingrid Silva, photographed by Nathan Sayers for Pointe. This is Pointe's June/July 2017 Cover Story. You can subscribe to the magazine here, or click here to purchase this issue. Thumb through Ingrid Silva's Instagram and you'll see plenty of beautiful professional photos of her dancing. But her profile feels much less curated than what's usually found online. She's hanging out with her brindle- coat French bulldog, Frida Kahlo. Or she's working with the outreach program Brown Girls Do Ballet. Or she's rehearsing at Dance Theatre of Harlem, where she's been dancing since 2008, leotard and tights on, Afro out. It's the perfect portrait of a modern-day ballerina. Silva, who is 28, has an impressive 47,000 followers. Many of them com- ment with the usual compliments about her line—her hyperextended legs and beautifully arched feet. But dancers, and even dance moms, regularly drop in to ask for advice. "Can I please ask how you dye your pointe shoes and with what... for my babygirl who has started ballet too," asks one follower. "Please DM and I will explain," replies Silva, with a smiley face. You could argue that a dancer's social media popularity is trivial to her work. And though it definitely doesn't define Silva's, it's been essential to her career. As she's established herself as a leading dancer at DTH, she's also begun to make a big name for herself outside the company. She's represented brands like Capezio, TNT Energy Drink and, most recently, ACTIVIA yogurt, all without the help of a publicist. Meanwhile, she has come into her own as an artist, taking on a range of rep at DTH and becoming one of its most visible members. 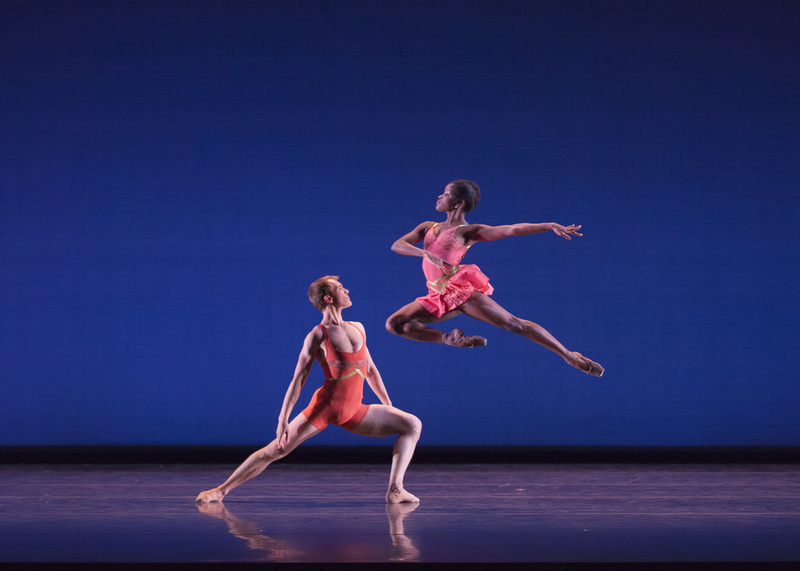 Samuel Wilson and Ingrid Silva in Vessels, Photo by Renata Pavam. Courtesy DTH. Social media fame and campaign ads sound glamorous. But Silva's life grow-ing up wasn't so sparkly. Her family lived near a favela, or an urban slum, in Rio de Janeiro, Brazil. Her parents—her mother is a maid, her father retired from the air force—encouraged her to keep busy with sports like soccer, basketball and gymnastics. She found ballet at 8, after a neighbor suggested she try classes through a community-outreach program. It clicked. After a few years, she was training at Dançando Para Não Dançar and then the school of Rio's prestigious Teatro Municipal, as well as with Brazilian contemporary dancers Deborah Colker and Pedro Pederneiras. As Silva flourished in ballet, she realized there were few pro- fessional opportunities for black dancers in Brazil. She says it left her no choice but to find strength in the daily process of technique class and rehearsal. "I didn't have anyone to look up to," says Silva, "so I've always been inspired by the dance journey itself." At the encouragement of her teachers, Silva auditioned to train with Dance Theatre of Harlem (through videotape), and at age 18 moved to New York City. It was the first time she had set foot outside of Brazil, and she didn't speak English (though you would never guess it now). "I was afraid," says Silva's mother, Maureny dos Santos Oliveira, about letting her move to New York. "But I had no doubt that this was her shot and she could not miss it." Yet as foreign as it all was for Silva, it also felt right. "As soon as I stepped into the building I was like, 'Wow, there are so many people that look like me.' I felt at home. I felt like I found myself," she says. Silva excelled. Within two months, she was asked by founder Arthur Mitchell to join DTH Ensemble, the junior company that performed during the professional company's hiatus, and became a member of DTH when it was reborn in 2012. Silva and DTH Company Artists in Dancing on the Front Porch of Heaven. Photo by Chris Walt, Courtesy DTH. It's a winter afternoon at the Dance Theatre of Harlem studios, and Silva is rehearsing Swan Lake's Black Swan variation and coda. It's been years since she's taken on a classical role—her rep consists of more contemporary works like Donald Byrd's Contested Space and Dianne McIntyre's Change. Yet she approaches it with mea- sured footing and quiet confidence, attacking fouettés and jumps with technical prowess and vigor. "It's very exciting to be able to use her power when you're partnering," says Silva's regular part- ner, Dylan Santos. "She's so strong, she makes everything work." Today, though, she could use a little more bravura. "You have to enter and arrive at sous-sus like this is your stage. You own it," urges artistic director Virginia Johnson in a coaching session. During a break, Silva practices stepping up into fifth position over and over. It's not quite there yet. Her eyebrows furrow together in dissatisfaction as she paces around, letting the correction linger. "Most striking about Ingrid is her determination and focus, her hunger to knuckle down and put her full concentration on what's needed," says Johnson. "Dance is partly a God-given talent. But it's also about having a vision to make something magical hap- pen. And Ingrid certainly has that quality." Silva attributes her success to hard work and the balance of having a normal life outside of dance. She spends her off time hanging out with her husband, a fellow Brazilian she met in New York. They hike (with their dog in a backpack), go to the movies and cook Brazilian food. "I think that's why my Instagram is so popular," she says. "This is who I am. I'm a person, too. People aren't per- fect—if you're going to have ice cream, post it!" Johnson echoes: "Ingrid is a 21st-century ballerina. She's a real human being and there's an honesty there. She's not here to seek fame." Ingrid Silva in "Return." Photo by Dinah Rogers, Courtesy DTH. Johnson is right—Silva is humble, even on social media. She says her goal is simple: to connect with audiences everywhere DTH travels. "I never imagined I'd ever be anyone's role model. But I'm honored to be able to inspire others," she says. "When I was young, I never saw anyone that looked like me. But with social media it's easier for people to be inspired." Though Silva has achieved her dream of dancing Black Swan, she would like to take on more classical repertoire in the future. She also hopes that her mom, who hasn't seen her perform since she left Brazil, will someday be able to come to the U.S. to watch her dance. Silva plans to continue to call DTH her home, but is interested in guesting with other companies (she's already worked with Armitage GONE! Dance, as well as groups in Brazil). She also wants to pursue a psychology degree and use it to coun- sel dancers. And eventually, she hopes to return to Brazil to start a school, similar to the one she started at. But for now, DTH seems to be Silva's perfect fit, not just because of its diverse repertoire, but because the message the company sends is very much in line with her own ethos. More than a ballet company, she says, "it's an elegant example of what is possible when an inclusive approach to art thrives."